Yoga for relaxation and for people with limited flexibility. The emphasis is on focus and breath, as we move the energy of the body through a sequence of poses, modifying according to the capacity of those in attendance. The benefits are multiple, including improved mobility of the joints, increased awareness, deeper relaxation and sense of well being. Gentle Yoga can also be helpful if you have injuries, post surgery, if you are in disease recovery or are overweight. Chair Yoga will be included when appropriate. Non-competitive, classical hatha yoga practice. Two kinds of pranayama (breathing exercises), sun salutations and a series of 12 postures with plenty of room for variations, modifications and relaxation. Tone and strengthen the body. Calm the breath. Focus the mind. Leave your cares behind. 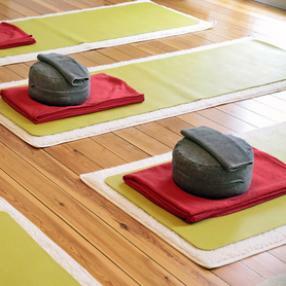 Relax into your weekend with this soothing and restful class. Learn to unwind and do less. Your body will thank you. TGIF! This rejuvenating practice integrates yin movements, long-hold postures using props, fundamental breath awareness (pranayama), mindfulness and meditation. These elements combine to foster a gradual and deep release of physical, emotional and mental tensions. With this our natural state of embodied presence and an undefended heart once more is revealed.